This is a collection of Star Trek fan fiction written to celebrate Star Trek: The Original Series. These stories include stories written about the captains and crews of the U.S.S. 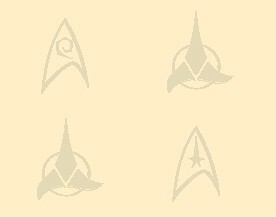 Enterprise, NCC-1701, NCC-1701-A and beyond. These stories are true-to-aired Star Trek as well as internally consistent with each other. To read the stories or for more information on how the stories are placed chronologically, please refer to each timeframe by clicking on the left-side graphics below or visit the ORION Universe Chronology. These stories either feature the Star Trek characters featured in Star Trek: The Cage as well as stories about the characters from Star Trek: The Original Series but set before their tour of duty on the Enterprise. Look for some of your favorite characters including Captain April, Captain Pike, Number One, Doctor Phillip "Bones" Boyce, Lieutenant Jose Tyler, Lieutenant Spock, Yeoman Jeanne-Marie Colt, Ambassador Sarek, Lieutenant Montgomery Scott, Ensign Hikaru Sulu, Lieutenant Jim Kirk, Doctor McCoy, Ensign Gary Mitchell, Amanda Grayson and even Transporter Chief Pitcairn. These stories feature the Star Trek characters from The Original Series and The Animated Series, and all stories are set aboard the U.S.S. Enterprise, NCC-1701, during the command of Captain James Tiberius Kirk. Look for some of your favorite regulars including Captain Kirk, First Officer Spock, Doctor Leonard "Bones" McCoy, Chief Engineer Montgomery Scott, Lieutenants Hikaru Sulu and Penda Nyota Uhura, Ensign Pavel Chekov, Lieutenant Arex, Lieutenant M'ress, Nurse Christine Chapel, Lieutenant Kevin Riley, Transporter Chief Kyle, Lieutenants DeSalle and Palmer and even Mister Leslie. These stories feature Star Trek characters from period of time following The Original Series and The Animated Series and just before Star Trek: The Motion Picture begins. Look for a diverse set of regulars including Admiral Heihachiro Nogura, Vice Admiral Lori Ciani, Admiral James T. Kirk, his nephew Peter Kirk, Spock, Doctor Leonard McCoy and his wife High Priestess Natira, Engineer Montgomery Scott, Intelligence Officer Hikara Sulu, Academy Instructor Penda Uhura, Security Trainee Pavel Chekov, Captain Willard Decker, Lieutenant Ilia, Interstellar Trader Kate Logan and Doctor Christine Chapel. Beginning with Star Trek: The Motion Picture (a.k.a. "In Thy Image"), these stories detail the adventures of the the crew of the U.S.S. Enterprise, NCC-1701, on its second mission under the command of Captain James Tiberius Kirk until the terrible events of the Serenidad Tragedy three years later. Look for some of your favorite regulars including Captain Kirk, Commander Spock, Doctor McCoy, Chief Engineer Montgomery Scott, Lieutenant Commanders Hikaru Sulu and Penda Nyota Uhura, Lieutenant j.g. Pavel Chekov, Doctor Christine Chapel, Lieutenant Xon, Transporter Chief Janice Rand, Lieutenant M'ress and Lieutenant Arex. Following the Serenidad Tragedy, the crew of the Enterprise found themselves in completely new situations. Admiral James Kirk and Captain Spock found themselves serving as instructors and deans at Starfleet Academy (all the while being used in some special assignments for Starfleet), while Dr. McCoy briefly served aboard the Reliant with Captain Terrell and Commanders Chekov, Kyle and Beach. Meanwhile, Captain Daniel Michael Williams had a new first officer named Hikaru Sulu, and Uhura found herself in the center seat of the Sadat. Cadets Saavik, Preston and Bushmiller attended Starfleet Academy. These stories feature the crew of the U.S.S. Reliant, NCC-1846, during the command of Captain Clarek Terrell. Featured in these stories are Executive Officer Pavel Andreievich Chekov, Chief Science Officer James Beach, Chief Security Officer Steven Kelowitz, Chief Communications Officer Jonathan Kyle, Chief Medical Officer Cynda Callison, Chief Navigation Officer Arex, Chief Helm Officer Dawson Walking-Bear and Assistant Security Chief Thela Kazanga. Look for some of your favorite regulars to make appearances from time to time as well. These stories are set starting just before the events of Star Trek: The Wrath of Khan and slightly beyond Star Trek: The Final Frontier. The primary crewmembers from the first and second missions under Kirk's command are reunited for a series of adventures which end with a return to Vulcan for the Enterprise and Sulu's subsequent departure for the captaincy of the science ship Cooper. 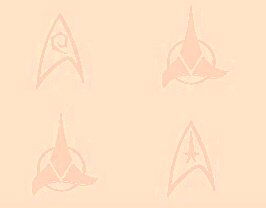 These stories feature Admiral Kirk, Captain Spock, Doctor McCoy, Captain Sulu, Lieutenant Commanders Chekov and Uhura, assorted cadets, Admiral Morrow, Sybok, Captain Esteban, David Marcus, Lieutenant Saavik, and even Lieutenant Commander Justine Smythe, Lieutenants Shah Jahan and Juan Rader of the U.S.S. Grissom. These stories are set following Star Trek: The Final Frontier and through Star Trek: The Undiscovered Country. Captain James T. Kirk is in now command of the U.S.S. Enterprise, NCC-1701-A. For one last time, he and his crew are again bravely going where no man has gone before. Joining Captain Kirk are Captain Spock, Doctor McCoy, Captain Scott, Commanders Chekov and Uhura, Lieutenant Reichard, Ensign Indri, Lieutenant Peter Kirk, Doctor Giacomo Eletto, Nurse Marie Webb and prankster Physician's Assistant Harrison "Hardav" Davids. These stories are set following Star Trek: The Undiscovered Country and through the beginning of Star Trek: Generations. Captain James T. Kirk has retired and finds the occasional dalliance. Captain Spock is serving with the diplomatic corps. Doctor McCoy has retired to Serenidad to practice some ol' country medicine after marrying Princess Teresa. Captain Scott is working with the Starfleet Corps of Engineers on refinements to Excelsior-class starship warp drives. Commander Penda Nyota Uhura has returned to Starfleet Academy as an instructor. Lieutenant Peter Kirk is instructing at the Academy as Cadet Demora Sulu is a cadet. These following stories are written about the captains and crews of the U.S.S. Enterprise, NCC-1701-B, as well as the U.S.S. Excelsior, NCC-2000; the U.S.S. Chosin, NCC-2950; the U.S.S. Hyperion, NCC-10100; as well as others. These stories are true-to-aired Star Trek as well as internally consistent with each other. To read the stories or for more information on how the stories are placed chronologically, please refer to each timeframe by clicking on the left-side graphics below or visit the ORION Universe Chronology. In 2285, Captain Sulu assumes command of the U.S.S. Cooper, an Oberth-class science ship. For five years, he commands missions that Starfleet doesn't feel worthy of the attention of one of its top-of-the-line starships. Fortunately, he's got a good crew. But patience pays off, and in 2290, he receives the command of the starship of his dreams: Excelsior. Unfortunately, his crew leaves a lot to be desired. These stories feature original and familiar characters such as Captain Hikaru Sulu, Executive Officer Rand, Doctor Ariel Cord, Chief Engineer Maliszewski, Chief Helmsman Lojur and Science Officer Tuvok. In 2295, the crew of the U.S.S. Enterprise, NCC-1701-B, discovered the lost ship U.S.S. Hyperion, a Federation prototype missing for nearly twenty years. Once back at Earth, the Hyperion was readied for reassignment and launched with its new captain, a new crew, and a new five year mission. These are some of the stories of Captain Uhura, Science Officer Drevan, Doctor M'Benga, First Officer Ken Reichard, Chief Engineer Indri, Communications Officer T'Soral, Helmsman James Marsden, Physician's Assistant Harrison "Hardav" Davids, Doctor Giacomo Eletto, Weapons Officer Joe Tucker and Nurse Marie Webb. These stories feature the Star Trek characters from The Original Series and The Animated Series, and all stories are set aboard the U.S.S. Enterprise, NCC-1701-B, during the command of Captain Pavel Andreievich Chekov who was given command following the events of the first act of Generations. Look for some of your favorite regulars to make appearances including Ambassador Spock; Surgeon General Leonard "Bones" McCoy; Captain Sulu, Commander Uhura, Doctor Chapel, Lieutenant Peter Kirk and Commander Saavik. These stories feature original characters set in the Star Trek universe. All stories are set aboard the U.S.S. Chosin, NCC-2950, during the command of Captain Shaun Kelsey, Executive Officer Thorrell, Chief Science Officer Arlene Williams, Chief Tactical Officer Hrisherisch, Chief Engineer Ghilar Stronton, Chief Medical Officer Shakura, Chief Helm Officer Aherrowla, Chief Navigator Miranda Roberts, Starfleet Marine Major Mason, Transporter Chief Rion and Physical Fitness Trainer Torval Q'stor. Look for some of your favorite regulars to make appearances from time to time as well. The following stories are written about the captains and crews of the U.S.S. Enterprise, NCC-1701-B, as well as the U.S.S. Excelsior, NCC-2000; the U.S.S. Chosin, NCC-2950; the U.S.S. Hyperion, NCC-10100; as well as other ships in the Sixth Fleet. Commanding this expeditionary force into the Beta Quadrant is none other than Fleet Captain Chekov, much to the delight of Captains Uhura and Kelsey, and much to the chagrin of Captain Sulu. The Beta Quadrant is an untamed sector of space, more of a frontier than anything else. Aliens of all sorts present new and unique challenges to the crews of these fine starships. In 2296, in the distant regions of the Alpha Quadrant, near Rigel and beyond, the crew of the U.S.S. Potemkin, NCC-1711, explores strange new worlds, seeks out new life, new civilizations and boldly goes as far as their starship will go. These are some of the stories of Captain Alec Grigory; Executive Officer Polim n'Ahman; Science Officers Patricia Allen, T'Noshi, Spampinato; Communications Officers Mtume, Sonaj; Helmsman Delaney; Navigator T'Nabi; Engineers Barton, Wallace; Security Officers Frazier, Richards; and Chief Medical Officer Maura Drake. These stories are often adaptations of scripts of the Project: Potemkin episodes and vignettes. For our main website, click here. For our on-line catalog, click here. This is collection of Star Trek fan fiction. This on-line fiction archive and the fanzines (fan-produced publications) from which the material was taken were created out of our love for Star Trek in all its forms, and they are not intended to infringe upon the established Star Trek copyrights of the estate of Gene Roddenberry, Norway Productions, Paramount, NBC-TV, ABC-TV, CBS-TV, Microsoft, Filmation, Simon & Schuster, Gulf+Western, DC Comics, Marvel Comics, Gold Key Comics, Malibu Comics, Harve Bennett, Rick Berman nor those rights of any other holders of Star Trek copyrights nor those of anyone else who has half a mind to sue me. Images and sound effects from Star Trek are the property of Viacom/Paramount. Note: ORION PRESS is a non-profit fanzine press. CBS, Viacom and Paramount own Star Trek. We only borrow it out of our love for it, and all income goes to pay only the printing and postage costs of producing these zines. Anyone who thinks I or any other fanzine editor makes money at this has 1) never met my wife who will tell you otherwise, 2) never done it themselves, otherwise, they'd know better and/or 3) not looked at my bank account since 1979.